Eric Cornel is living the dream. Last week, the 15-year-old Kemptville resident got an education like no other at an elite hockey camp in Mississauga, ON. 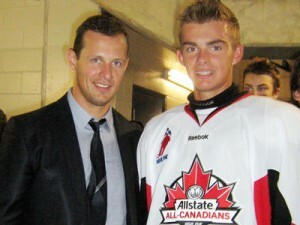 Cornel was one of 42 bantam all-stars selected from across the country to spend five days skating alongside current NHL players and learning the ins and outs of nutrition, fitness and sports psychology at the inaugural Allstate All-Canadians Mentorship Camp. “It’s been a really incredible experience having these NHL guys here to show us some stuff,” Cornel said during a phone interview after a stick-handling tutorial with Ottawa Senators star Jason Spezza and reigning rookie of the year Jeff Skinner at the Hershey Centre. The intensive camp was hosted by Gary Roberts, a 21-year NHL veteran and fitness guru who now spends the offseason putting current NHLers like Skinner and Steve Stamkos through their paces at the Gary Roberts High Performance Centre in Toronto. The young players were told to focus on working hard on the ice and in the gym to “strategically prepare” to play at the highest level.